The minimum quantity lubrication MIKROMAX MVD is a system that operates according to the Venturi principle, ie compressed air supplied atomized in the nozzle thin liquid lubricant for cooling mist. The compressed air and coolant flow rate can be finely adjusted with needle valves independently of each request. The system operates from an air pressure of 2 bar. At a higher pressure up to 6 bar, the coolant is atomized appropriately fine. An advantage of this system is that the cooling of the tool is effected by mist cooling, and compressed air. 1. The switching on and off of the coolant takes place manually via a ball valve. 2. The compressed air and coolant flow rate can be sensitively and independently adjusted and fixed by needle valves. A complicated setting by turning the nozzle head is omitted, as in other models. 3. No dripping after the coolant valve has been banned. 4. No check valve which hinders the Venturi effect. 5. The container for the coolant can be set up arbitrarily and above the nozzle. The ball valve prevents emptying of the container. 6. 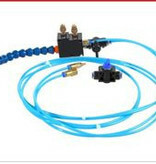 This system can also be used as air nozzle despite coolant reservoir is connected to the blowing out of chips or simple air cooling only by opening the air valve. For users who do not want to park on the needle valve, the air supply, we have included a manual valve. This manual valve can be mounted at any location on the machine. The air supply is then passed through this valve. This has the advantage that after turning the needle valve for air does not have to be readjusted and thus makes the application easier. 1. nozzle with flexible hose joint. 2. Gemischreguliereinheit with ball valve for coolant. 3. Ca. 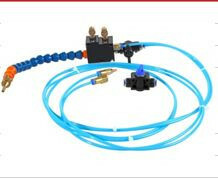 2m suction hose with suction filter. 5. Hand valve for air to be mounted on the machine.